The background was created using acrylic paints and clingfilm. .left over night to dry before removing the clingfilm. 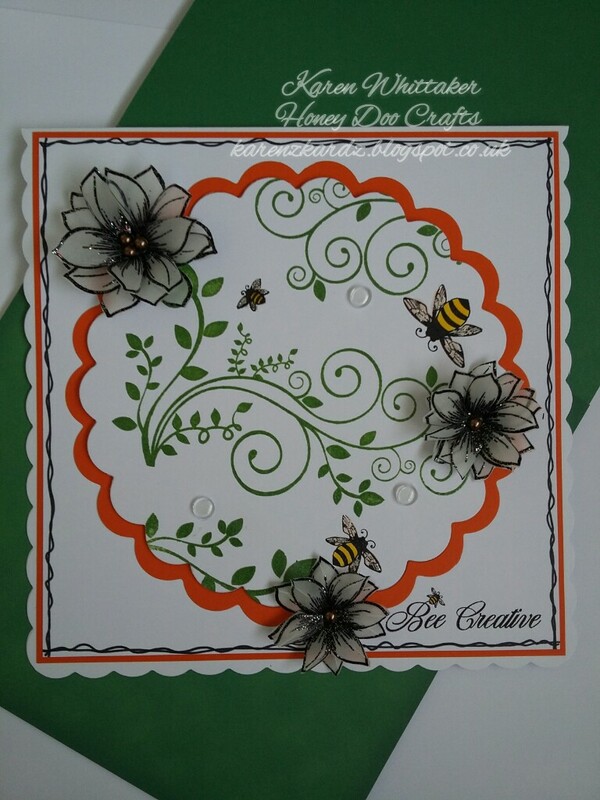 The bee flourish was stamped onto the background using Versafine black onyx ink. I created a watercolour effect on the scallop frame using Kuretake clean colour pens and water. How are we all? Midweek already..where do the days go. 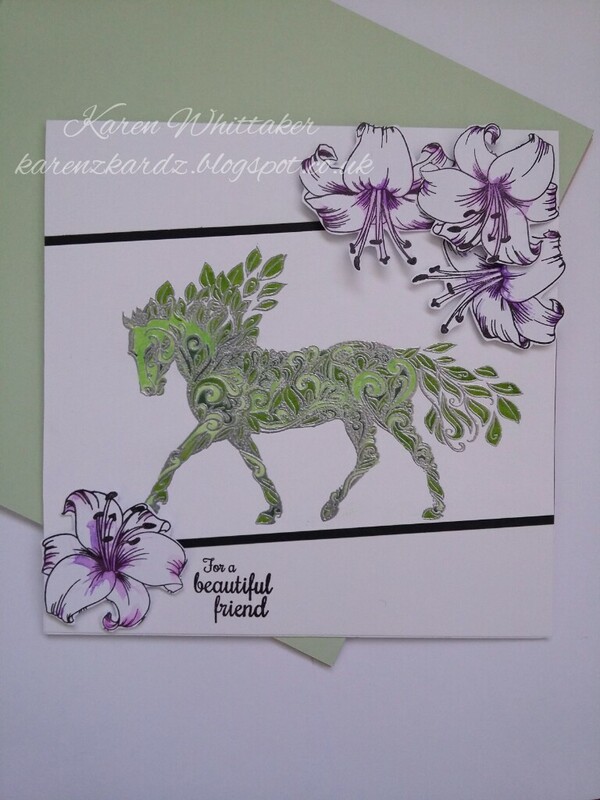 The mare was stamped and heat embossed in silver and then coloured in using Kuretake clean colour pens. I layered the mare onto black card and attached to card blank. The lovely lily was stamped several times, coloured in with Kuretake pens and a water brush, then each was cut out individually. They were shaped before attaching them to the card blank with foam pads. A sentiment was stamped to complete. I wanted to share a few cards I made using this really cute stamp set. I was asked to make a few CAS cards and this is the result. In each of these I stamped the images in smokey gray versafine ink. They were coloured with Kuretake clean colour pens and a water brush. In the first one I used a masking technique to create the impression of dimension withing the layout. Hooe you all had a wonderful Mothers Day yesterday. Now it's been received I would like to share the card I made for my mum. 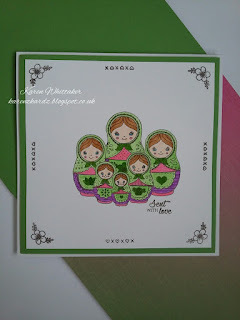 As soon as I received these new stamps to work with on samples, I knew I wanted to make my mum's card with them. 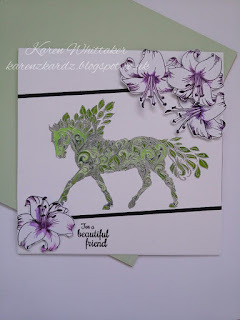 I masked them off and stamped the Trellis background in both. 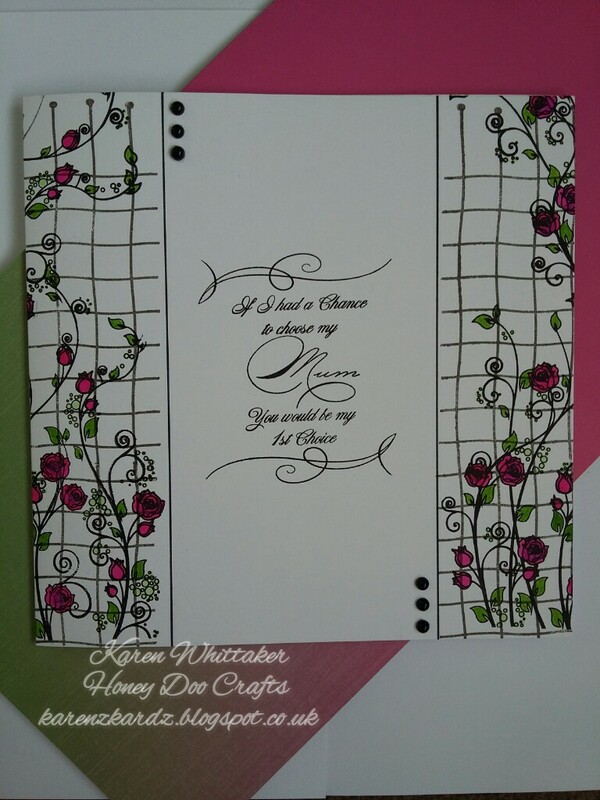 I then stamped the Rose Trellis over the top. 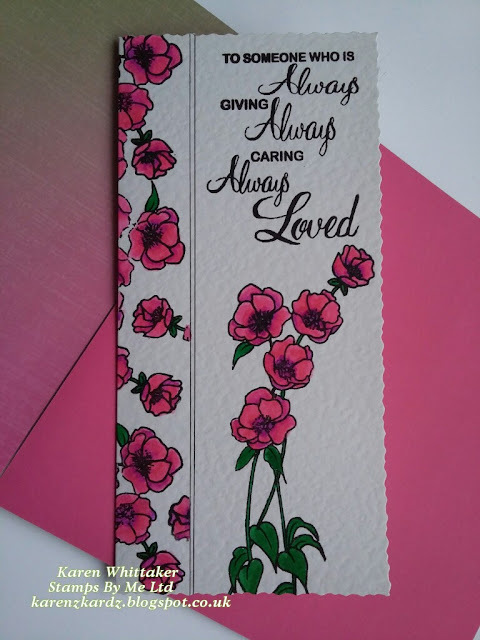 The sentiments were stamped in the centre panel using Versafine ink..but the Mum was inked using the same pink kuretake pen as the roses. 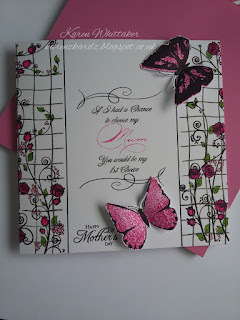 The lamination butterflies were stamped and coloured in with the pens and then cut out and mounted with 3d gel. I hope you like the card...my mum loved it! I stamped the two outline stamp sets randomly in versafine smoky gray ink, over the top of the card blank, to appear as though they were coming down the page. The sentiment was stamped in the versafine to finish. Hope you're all well and have a lovely day. I first used my kuretake pens, and water, to create this smooshed watercolour background. 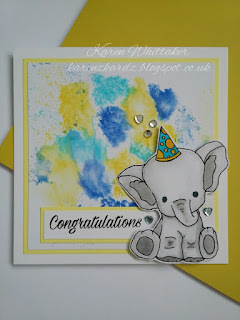 Using smokey gray versafine ink, I stamped the elephant onto white card then using my kuretake pens and a water brush, i coloured him in. Hope you like it and would love to read all your comments. How are we all today? Anyone got a day of crafting? I first cut off a strip from the front of the card blank then drew two lines to create a panel on the inside right of my card. 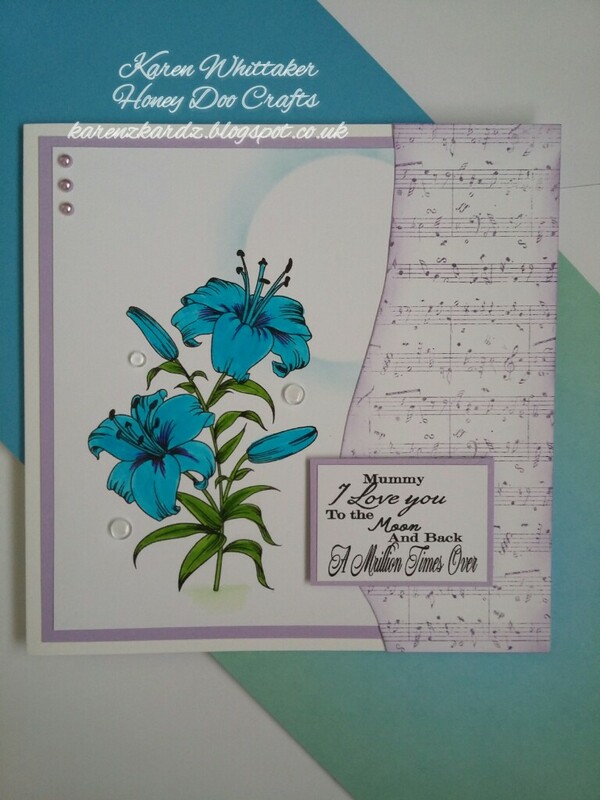 I randomly stamped the Lily in the panel, with versafine ink and then stamped the complete image on the front of the card blank. I coloured the flowers using Kuretake clean colour pens. 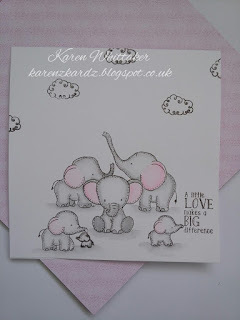 The sentiment, from www.stampsbyme.co.uk was stamped using Versafine ink. A couple of sequins completed this card. How are we all today? Hope you have a fun day planned. I drew swirls with a resist pen then created a smooshed water colour background using Kuretake clean colour pens. 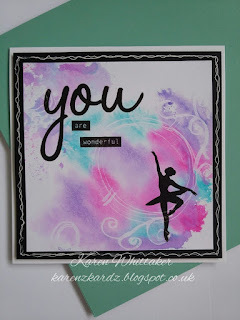 I ensured the card was completely dry before stamping the ballerina in versafine black onyx ink. I matted the card onto black card the used foam pads to adhere to card blank. 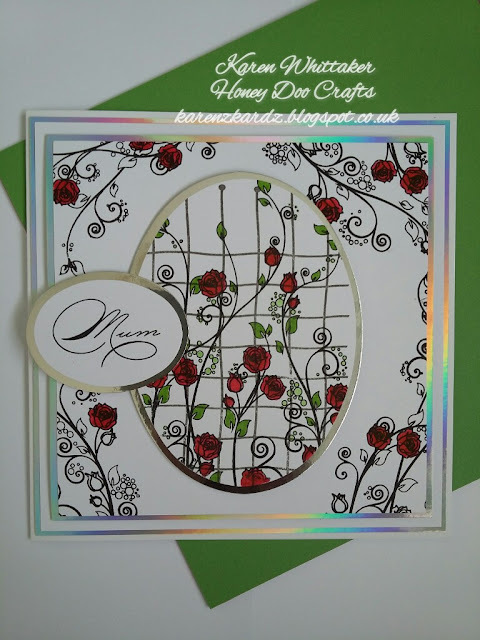 I used a white pen to create a wavy line round the black card to create a frame to my stamped image. Another Monday, another week in store, what will it bring. I stamped the Campervan onto a strip of card, with versafine and then masked it off so I could stamp the flowers onto the camper itself. This was matted onto black card. Flowers from the You stamp set by Julie Hickey were stamped randomly over the bottom half of the card blank and then coloured in with Kuretake clean colour pens. 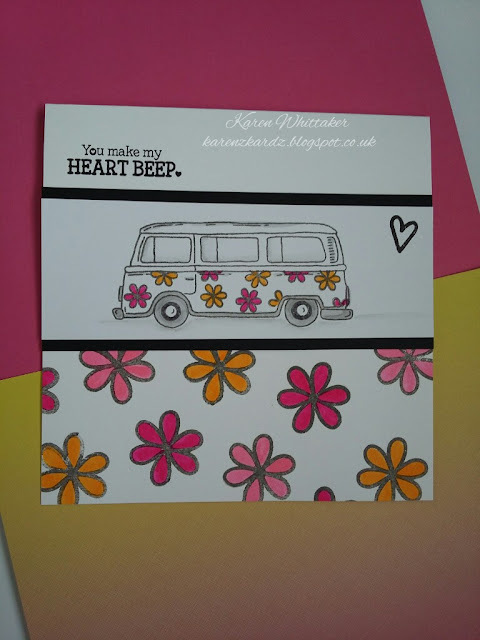 The Campervan strip was added to the front of the card blank using foam pads and the sentiment stamped to complete. Hope you all had a fab Sunday. I've been busy making some samples for a new launch...so watch this space. I created a watercolour, smooshed background with distress inks and kuretake clean colour pens, whilst also using a resist pen to add some swirls. I then stamped and heat embossed the sunflower and coloured it in using the kuretake pens. The background was matted onto black card then attached to card blank with foam pads, before adding the sunflower with 3d gel. The sentiment was stamped in versafine to complete. Hope you liked it and many thanks for taking the time to look. 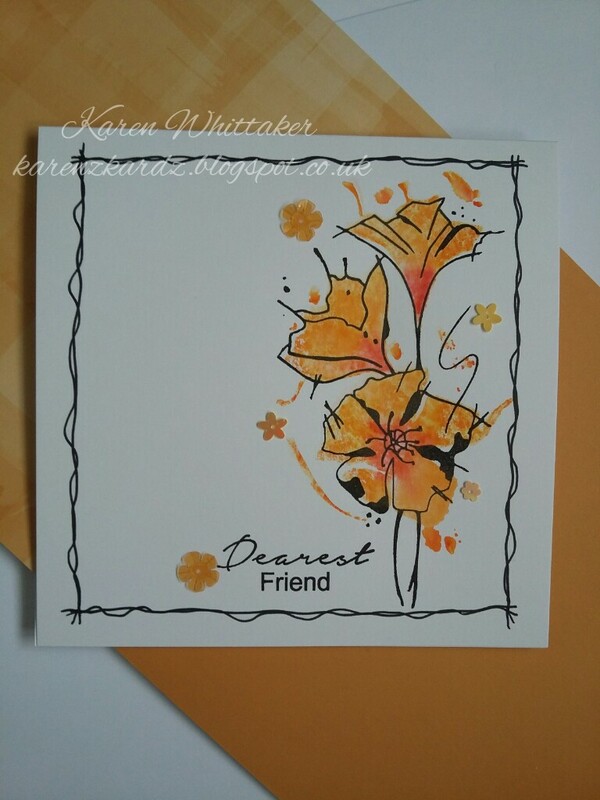 I then applied kuretake clean colour pens direct to the solid flower stamp, using a variety of different colours. I wanted them all to be different shades, but have the purple in common. Using a water brush I added water around the outside of the flowers, then dropped the ink from the glass mat, allowing it to run/smoosh around. I matted some monochromatic paper onto the card blank then used foam pads to adhere the topper. Hope you're all good and are looking forward to a crafty weekend. 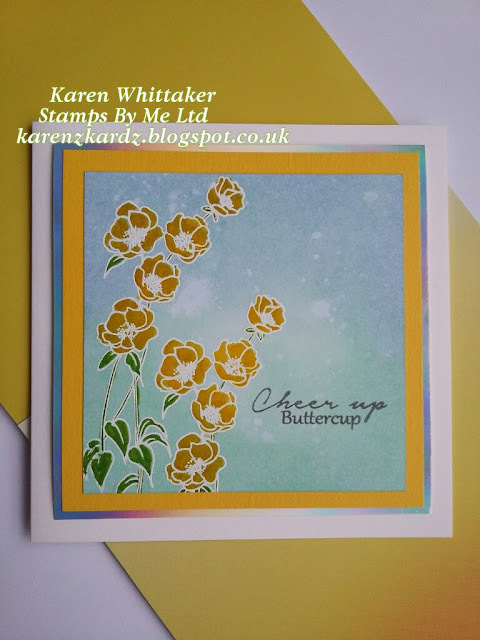 It's also part of the stamp and scratch range so a special gold or silver sticker can be added to the centre of the flower and when scratched off by the recipient it reveals a message. 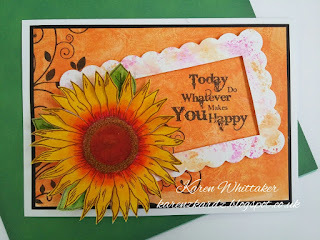 For my card I randomly stamped the sunflower over some card. 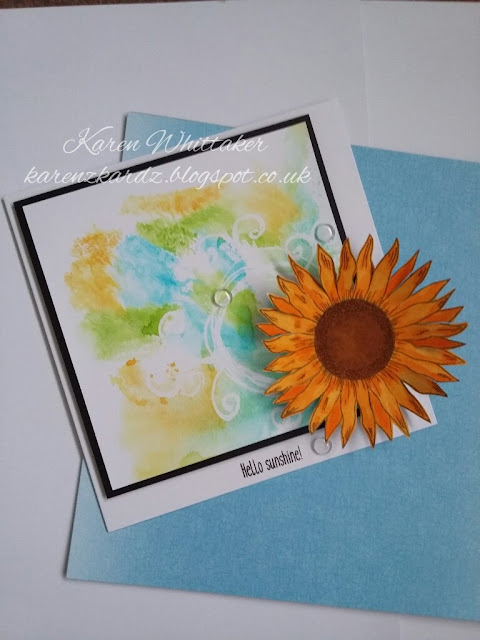 The awesome sunflower was stamped and embossed in black and then coloured in with Kuretake clean colour pens. 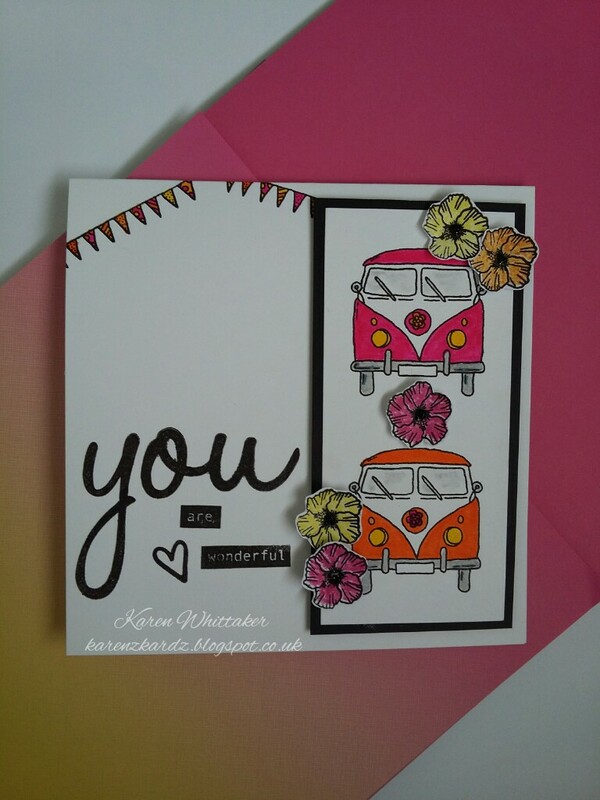 To create this card I stamped the Campervan on card, masked off the outside so I could stamp small flowers on the van itself. I coloured the remaining van with Kuretake clean colour pens. 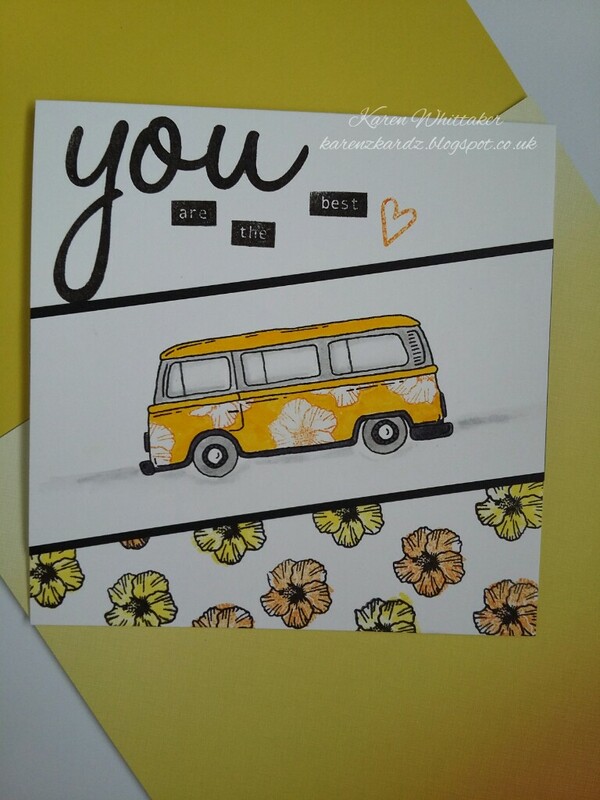 I matted the campervan onto black card. I then stamped the layered flowers onto the lower half of the card with distress inks. 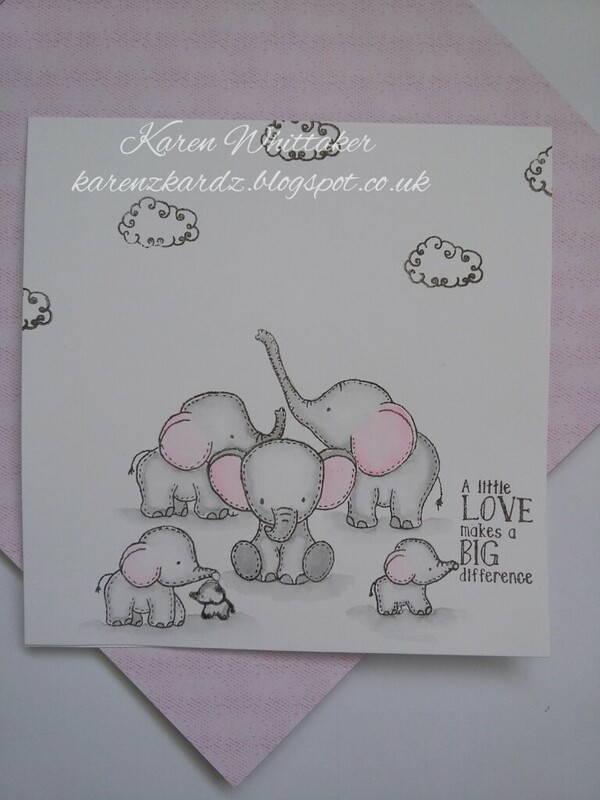 For my second card I stamped the images on a strip of card and coloured them in with Kuretake clean colour pens. This was layered onto black card. I stamped and coloured in the bunting onto the card blank then adhered topper to card blank with foam pads. The sentiment was stamped in black onyx versafine ink. 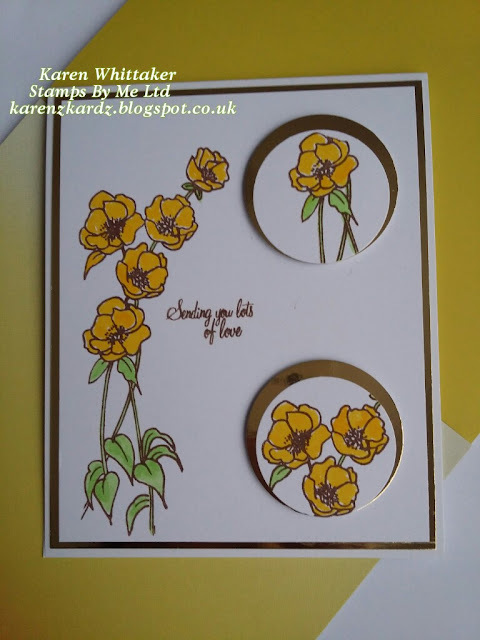 To complete I stamped, coloured and cut out several flowers and added them to the card with foam pads. Thankyou for taking the time to have a look and please leave a comment as I love to read them all. Finished work and having a much needed cuppa lol. I then stamped each Babushka Doll, starting with the one I wanted at the front first, then masking each one off before stamping the next one, so they stood behind each other. Kuretake clean colour pens were used to colour them in. Love these pens..so juicy and vibrant. 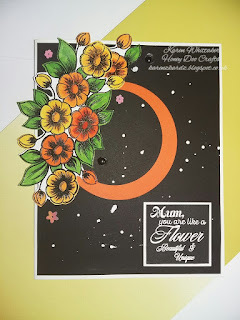 The Trio of flowers stamp set was used on vellum to create the flowers. . Heat embossing them in silver then colouring them in on the reverse side. 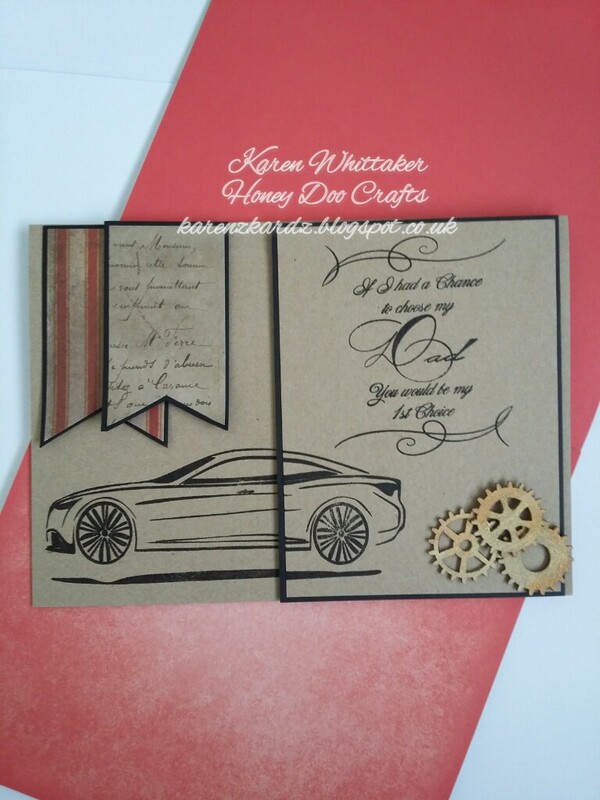 The sentiment was stamped to complete the card before matting and layering onto the card blank. Thankyou for stopping by and please leave a comment as I love to read them all. Hope you're all well. 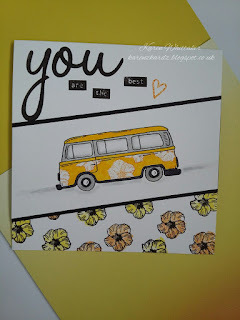 Been having a play with some new stamps from Hunkydory For the Love of Stamps. 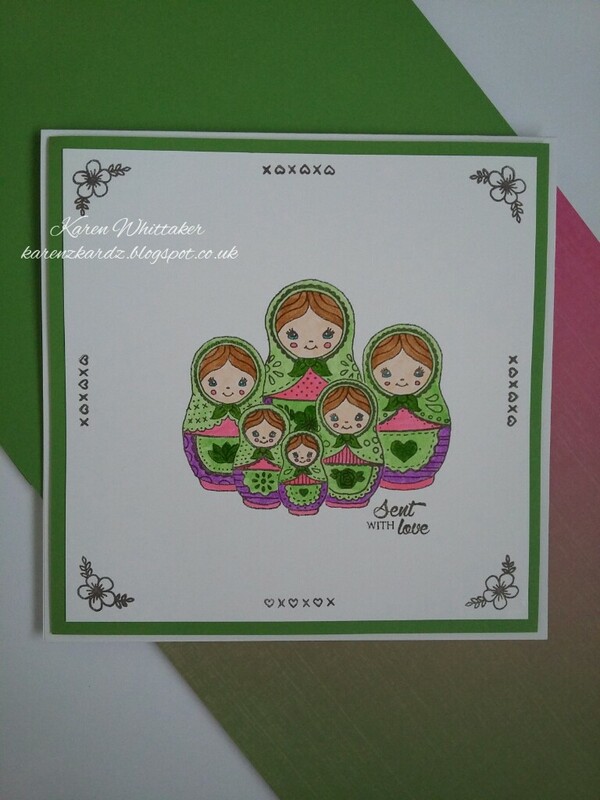 These are the gorgeous Babushka Dolls.. how cute are these and soo versatile. For both of these cards I used a masking technique to create the effect of dimension, stamping the image I wanted in the front first and then masking each stamp thereafter . I used kuretake clean colour pens to colour the images in, giving them a vibrant look. The sentiments and other embellishment stamps were stamped in black onyx versafine ink to complete. Hope you like them and thankyou for popping by. 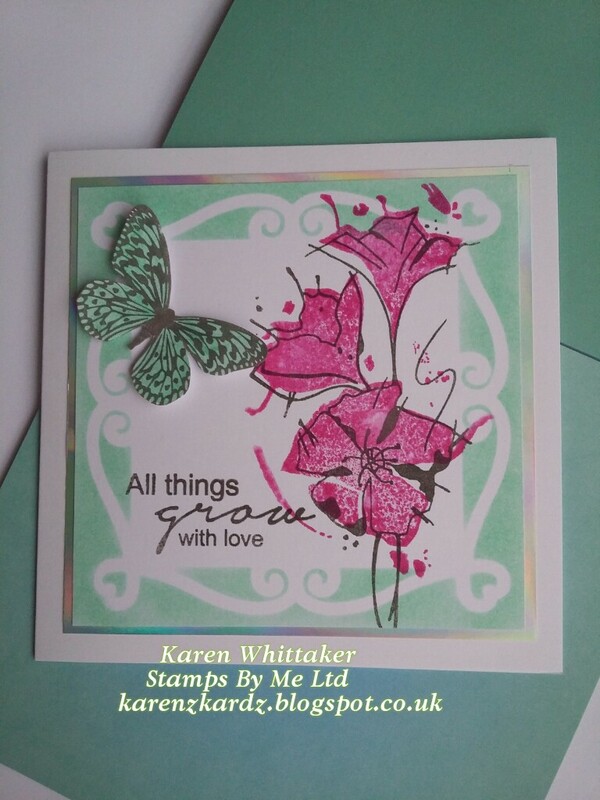 This is using one of my favourites, the Lovely Lily stamp set. I've also used another two new stamp sets, Music Notes and Mum sentiment stamp. I cut a white card panel to fit on a card blank and then cut another shaped piece of card that will sit above the panel. I used a mask to create a moon with distress inks, that would peep out from under the shaped card once assembled. On the shaped panel I randomly stamped the music notes in lilac ink and distressed the edge on the same colour. The Lily stamp was then stamped onto the main card panel using Kuretake clean colour pens to colour in. 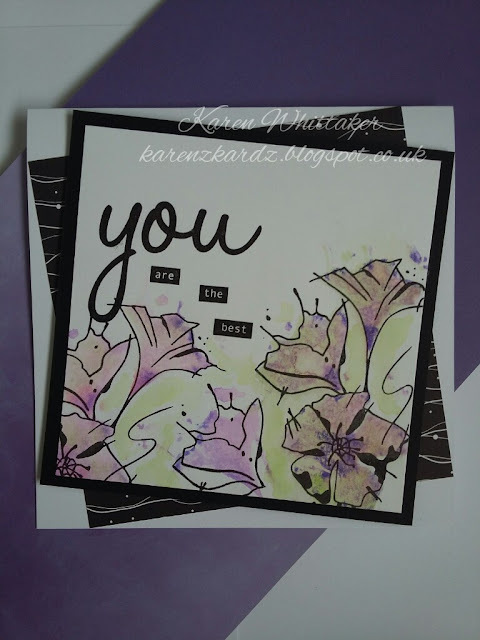 The sentiment, from the Mum stamp set, was stamped and matted onto lilac card. The sample was then assembled using wet glue and foam pads to add depth. A few pearls finished it off. Using a circle mask I created a sun using distress inks then stamped the bee flourish in black versafine ink. I stamped the bees and coloured in with Kuretake clean colour pens. 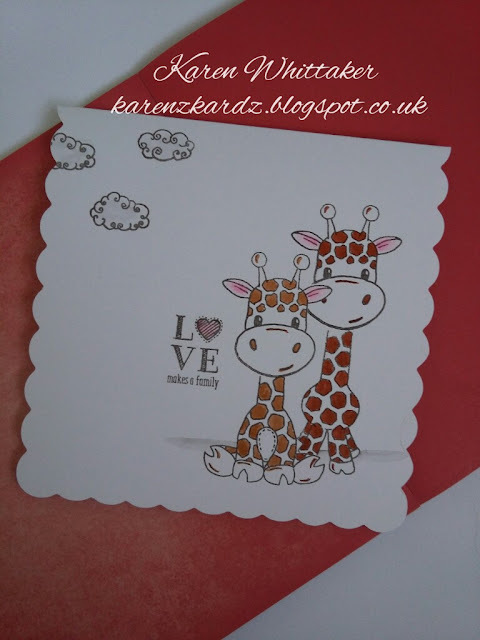 I stamped and coloured a couple more on a seperate piece of card and cut the out. 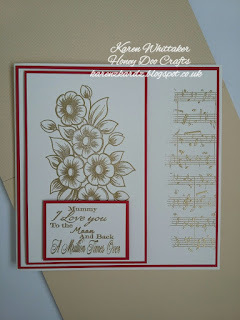 The flowers were stamped, heat embossed and coloured on vellum then cut out and shaped on a moulding mat. The card was then assembled with two coloured card panels adhered randomly before attaching the topper with foam pads. I die cut a white scallop card panel and an orange scallop frame. The little Lillies were stamped and heat embossed onto vellum, glued and shaped. The sentiment was stamped on versafine ink. The card was then assembled using wet glue and foam pads to add dimension. 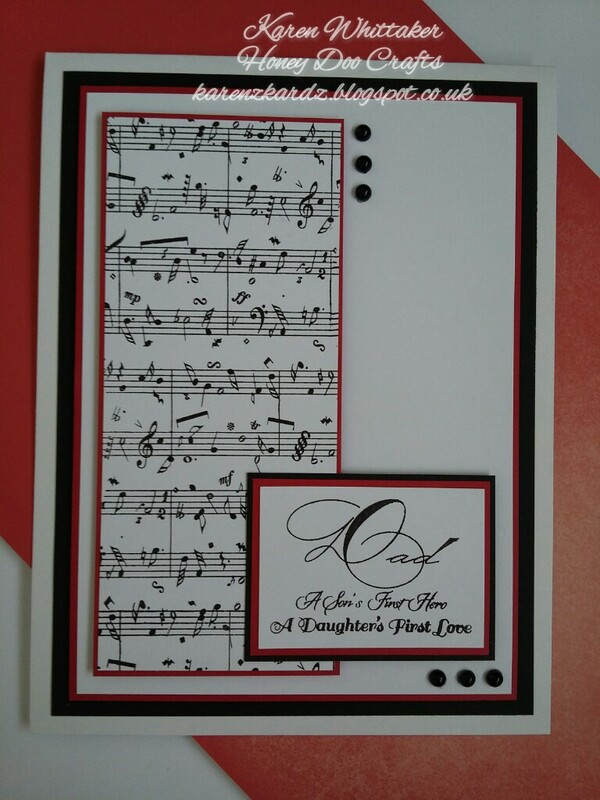 The music notes were stamped in black versafine onto a white card panel and then matted onto red card. The sample was then assembled with foam pads and a few black pearls were used to finish it off. I randomly stamped the music notes in 3 sections on the left side of a white card panel. Using an acrylic block I smooshed distress inks, spritzed with water, randomly over the 3 sections. I used kitchen towel to blend colours into each area to add more effect. The sentiment was stamped in black versafine and then the panel was matted onto black and blue card before adhering to card blank. 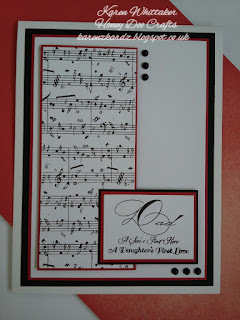 I also used their new stamp Music Notes, on the second sample. I splattered white ink on some black card before adhering it to card blank. 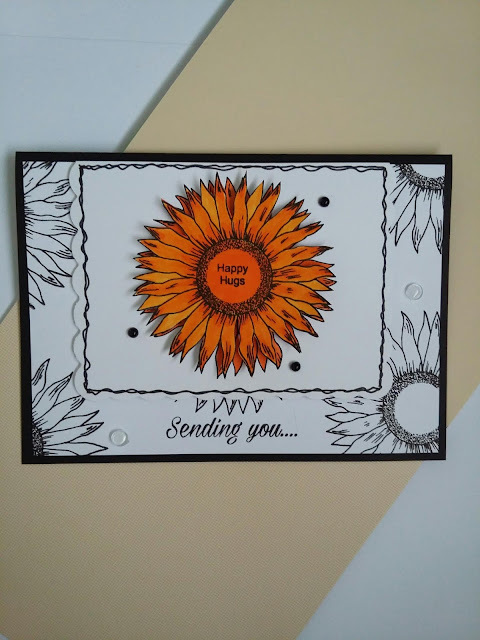 The daisy was stamped and embossed twice onto white card and coloured in with Kuretake clean colour pens. I cut up one of the daisy displays into seperate flowers. 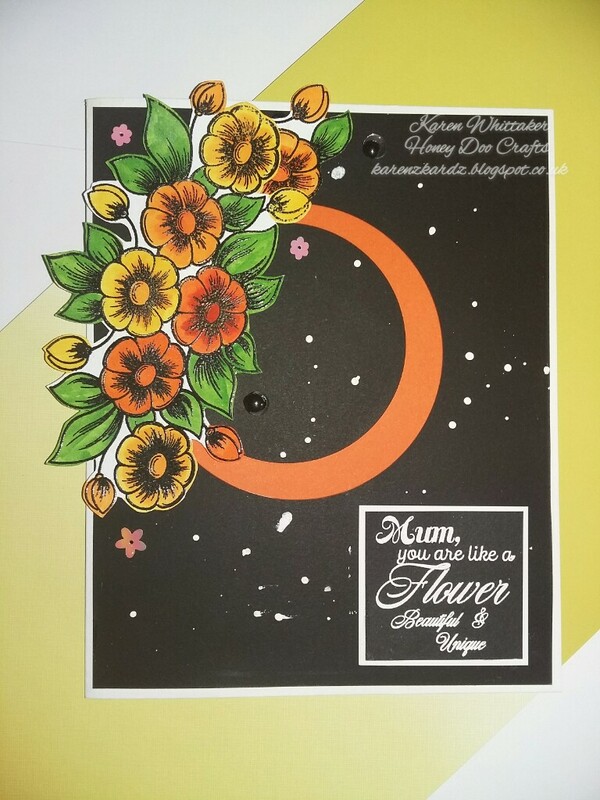 I cut out a circle from orange card and attached it to the black card then added the complete daisy display with foam pads. The seperate daisies were then added around the display to add more depth. The sentiment was stamped and heat embossed in white onto a piece of black card and then matted onto white, and adhered with a foam pad. Gems and sequins were added to complete. 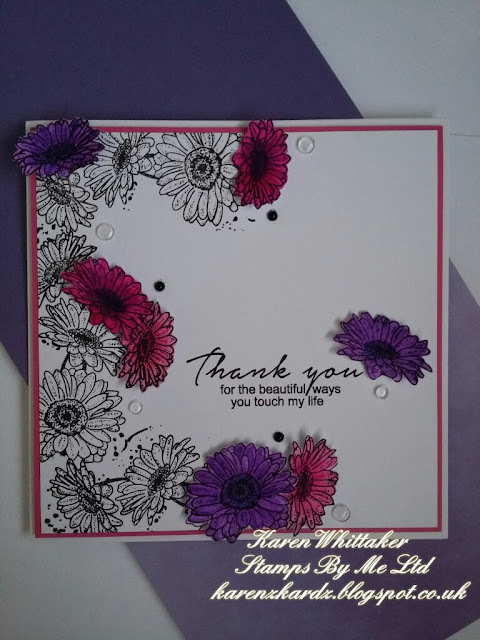 For my other sample I stamped and heat embossed the daisy display onto a white card panel before matting it onto red card. 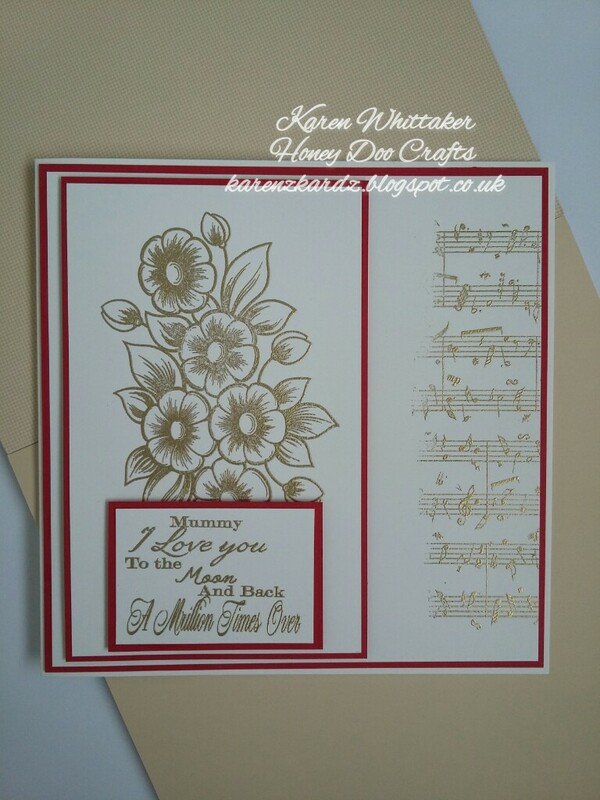 I stamped and embossed part of the Music Notes stamp in gold, onto the right side of a larger panel of white card. This was then matted onto red card. 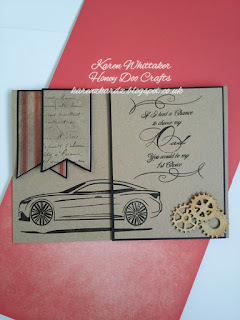 The sentiment was again heat embossed in gold and matted onto the red card. The sample was then assembled using foam pads to added dimension. Thankyou for taking the time to have a look. I'd love to read all your comments. 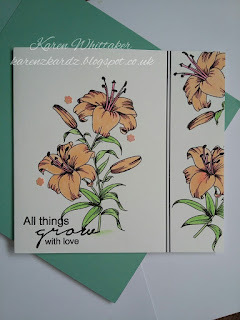 This is from the All Things Grow With Love stamp set. I first positioned where I wanted the scallop frame to go and then stamped the flower heads in grey versafine ink. I inked the frame with distress inks then tacked it in place so I could stamp the main flower image in black versafine, ensuring it overlapped slightly onto frame. The frame was then attached using foam pads before matting the card onto pink card. This was then adhered to the card blank. The gems were added to complete this sample. Thankyou for stopping by and leaving comments. I read them all. I created a card blank from kraft card then cut another strip of card which I stuck onto the card blank with temporary adhesive tape. I stamped the Car image in black versafine ink ensuring that part of it stamped onto the vertical strip. I removed the kraft strip, matted it onto black card and attached it to the card blank with foam pads. I created two tags using some random papers and black card. Gilding waxes were used on several mdf cogs to complete this sample. 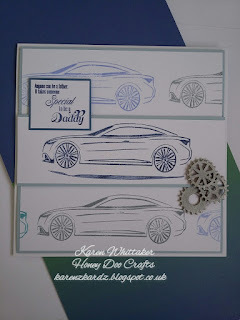 To create this next sample I stamped the Car image in several shades of blue and grey inks, randomly over white card. This was then matted onto blue card. 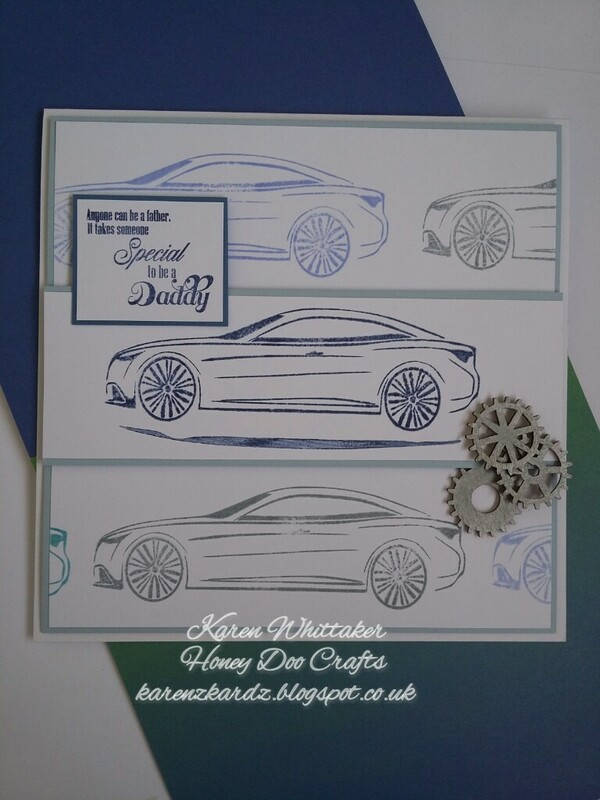 I stamped another car in darker blue ink which was also matted onto blue card and this was attached to the card blank with foam pads. I stamped the sentiment from the Dad stamp set, matted it onto blue card before adhering with a foam pad. To complete this sample I used silver gilding wax on several mdf cogs snd attached using gel glue. I hope you like these samples and would love to read your comments. 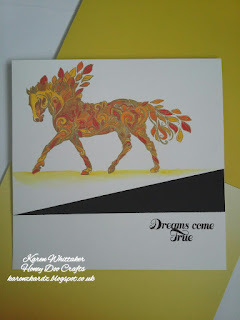 I stamped and heat embossed the image in gold embossing powder and then used Kuretakeclean colour pens to colour it in. The sentiment was stamped in versafine black onyx to complete the sample. Also included on the samples are two new sentiment stamp sets, First Choice and Mum. For both samples I used Versafine Black Onyx Ink pad to stamp the images and Kuretake clean colour pens to colour them in. 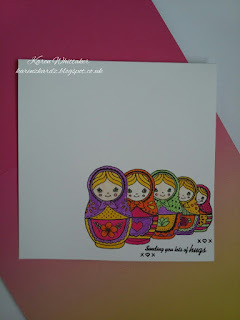 I love these stamps..so pretty and so versatile. I'd love to know what you think...I do read every comment, and if you like my work please feel free to "follow" my blog for more inspiration. Sharing my second post for today. I stamped the Lovely Lily in smoky gray versafine ink onto my white card mat. 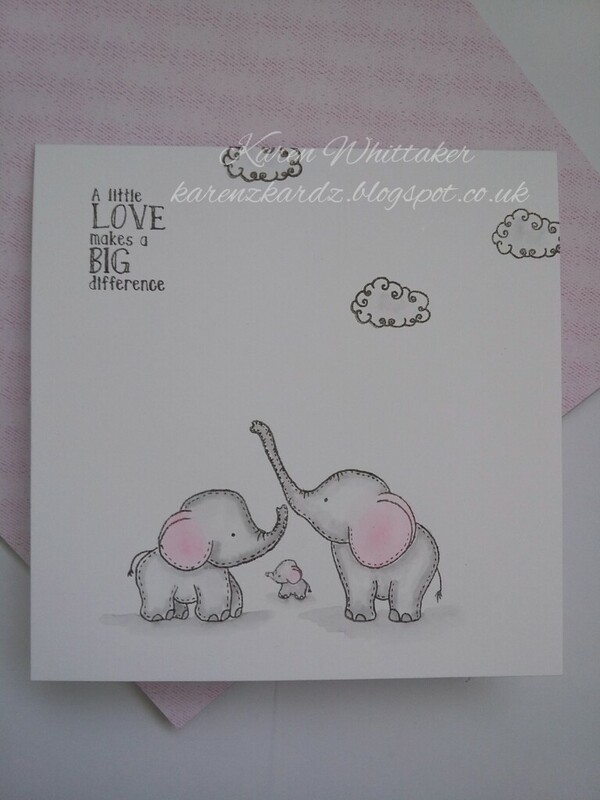 I also stamped another on a seperate scrap of card. The ones on the scrap card were then cut out. 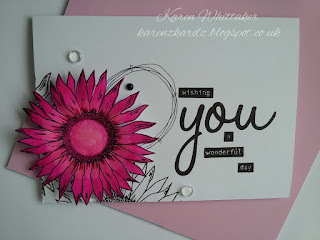 I cut a circle die cut in pink card and, before attaching with foam pads, I stamped the beautiful sentiment on the card so it sat within the circle die cut. 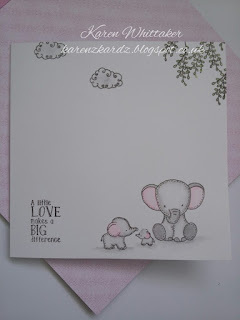 I then assembled the card onto the pink card mat and onto the card blank, with foam pads, to gain depth and dimension. A few gems were added to finish. I simply stamped the stamp randomly around the left side of the card, ensuring parts of the stamp went off the page. 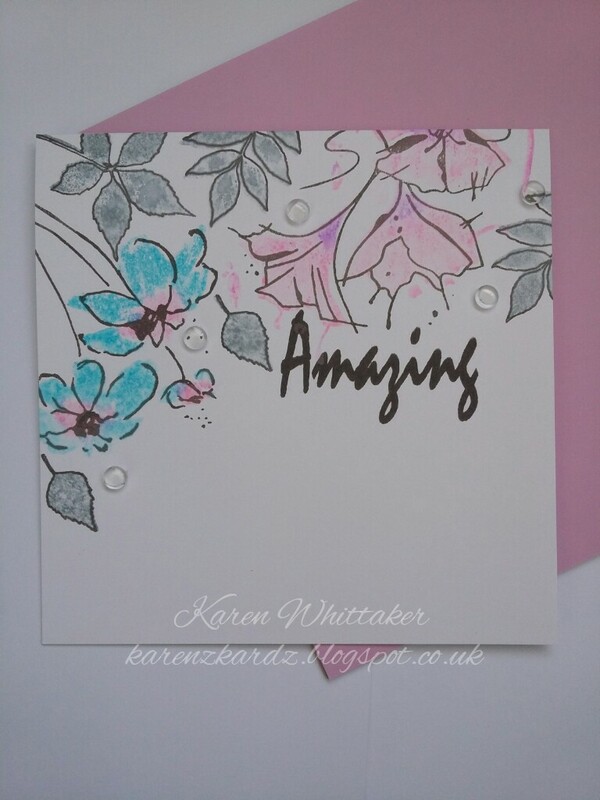 I then stamped it again on white card and coloured it in with Kuretake clean colour pens. It's called the Majestic Mare, and it certainly lives up to its name. The flower stamp is Daisy Display..so beautiful. I heat embossed the mare in black and then used Kuretake clean colour pens to colour it in. I matted it onto black card and then onto a card blank. 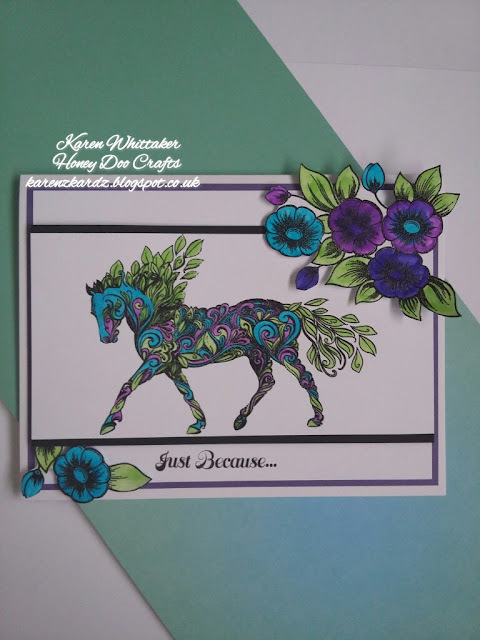 I then stamped and heat embossed a few of the daisies set, coloured them in, cut some off seperatly and layered them around the mare using wet glue and foam pads, to add dimension. The sentiment finished off this sample. 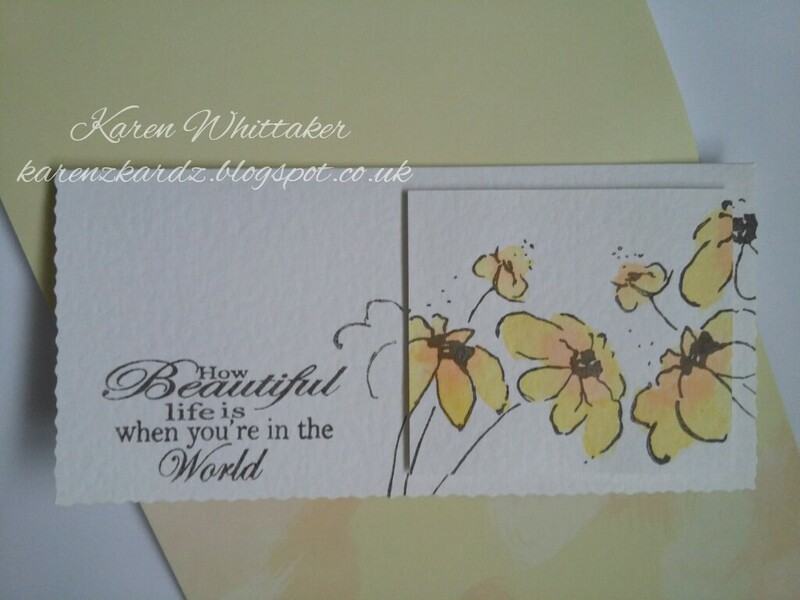 I used texture paste through a stencil to create the background and then stamped the image onto white card. This was coloured in with Kuretake clean colour pens and cut out. The flower was also adhered to card blank with foam pads, having first tied twine round the stem. This set is the beautiful Always Loved stamp set. To create the background I blended distress inks and spritzed with droplets of water. 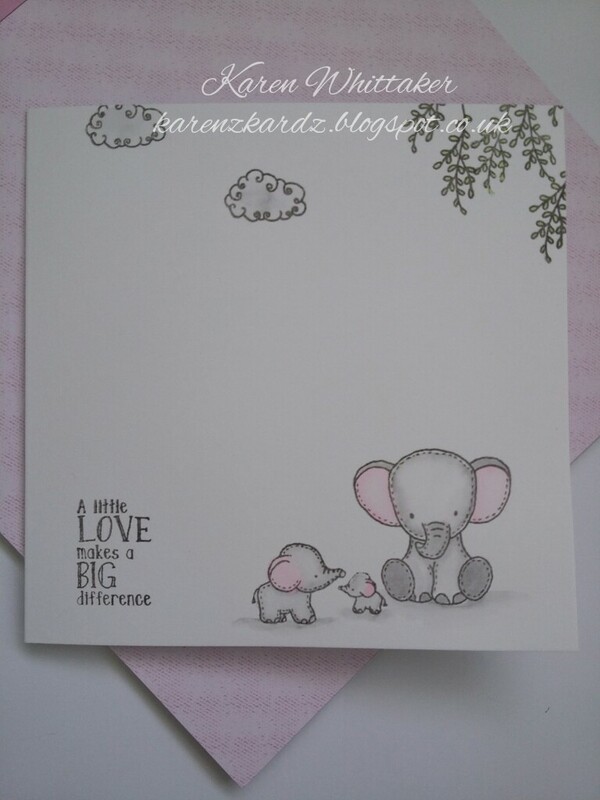 The stamp was stamped with Versmark and heat embossed in white before colouring in with Kuretake clean colour pens. The beautiful sentiment was added before matting and layering onto a card blank. I then stamped the outline stamp in black versafine and then stamped the solid stamp with distress ink, spritzing with water first to create a watercolour effect. The sentiment was added to complete. 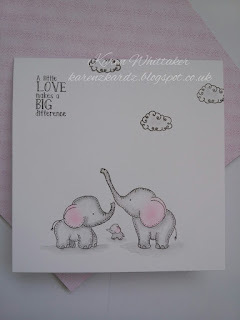 Sharing another DT sample using the new Always Loved Buttercup stamp set being launched by Stamps By Me Ltd.
For this sample I used a fine line pen to create a panel on the left side of the card blank. I inked up the Buttercup stamp using Versmark and stamped randomly within the panel. I then I'm stamped the full image and sentiment to the right of the panel and coloured in the image using Kuretake clean colour pens. 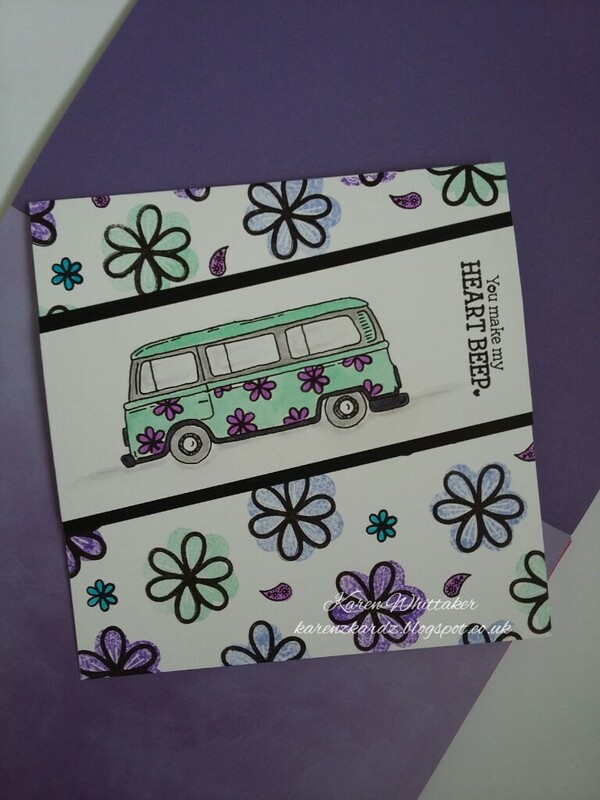 For this sample I stamped..heat embossed and cut out several of the beautiful Daisy stamps. These were then coloured in using Kuretake clean colour pens. I layered shaped white cardstock onto a white card blank, then attached the Daisies using wet glue and foam pads to create different depths of dimension. A day off for me before I'm back to work tomorrow. I've used the stamp sets and mask within the 3 cards. 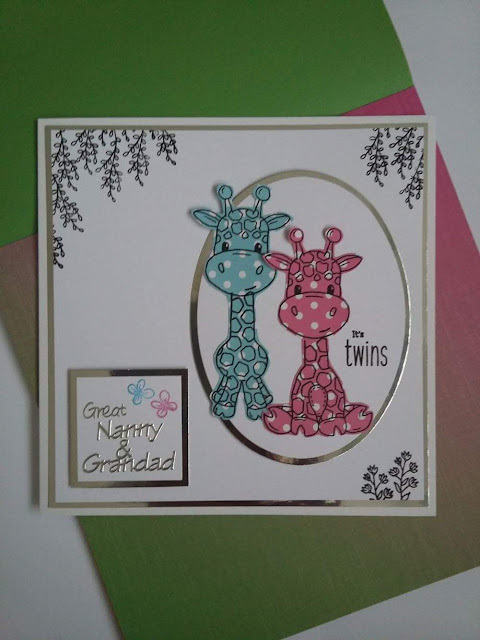 I stamped onto the Polka Dots background paper pad on the twins card. To colour I've either used distress inks or kuretake clean colour pens. This is such a fun and versatile set and I hope you like what I've made. Three flowers were stamped onto Ink Me card using Versafine and then coloured in with Kuretake clean colour pens. They were cut out and then attached to card blank using wet glue and foam pads to create a 3d effect. 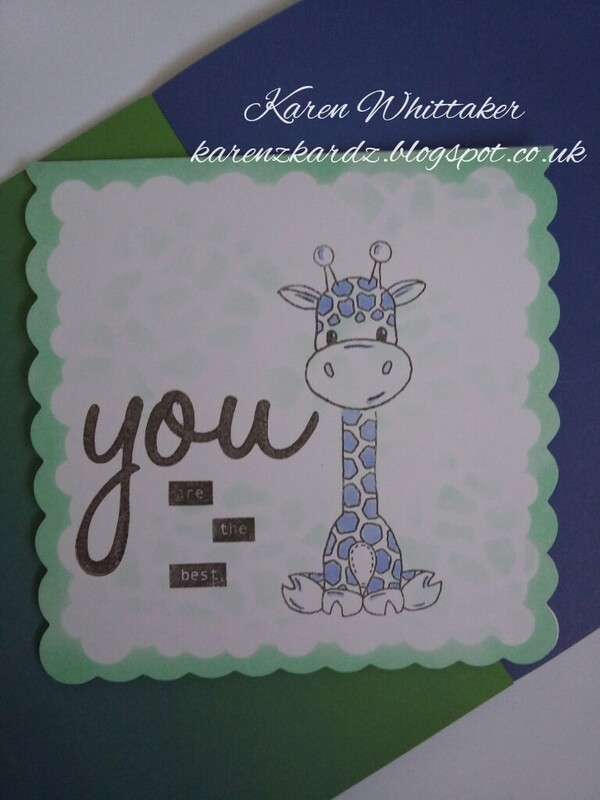 The sentiment was stamped onto card, matted onto mirri and attached to card blank to complete. I created a card blank using Kraft card and due cut out a fancy oval. I matted and layered papers from the Stripey Background paper pad. I then took a smaller piece of coloured paper and stamped part of flower head and some bees, with versafine ink. These were coloured in with Kuretake clean colour pens. 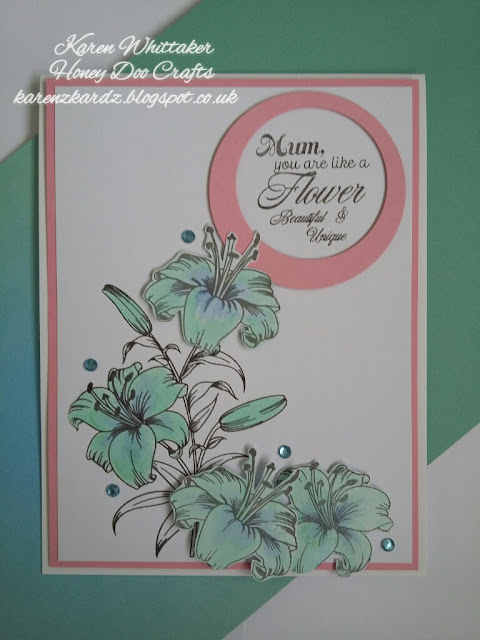 I then stamped a full flower head onto an oval die cut card and coloured with Kuretake clean colour pens. 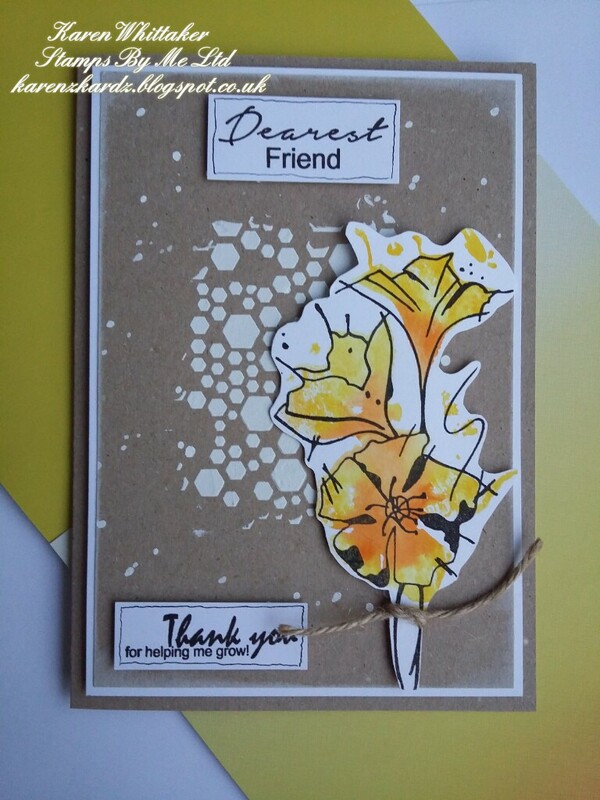 The flower was masked off and leaves then stamped and coloured in. 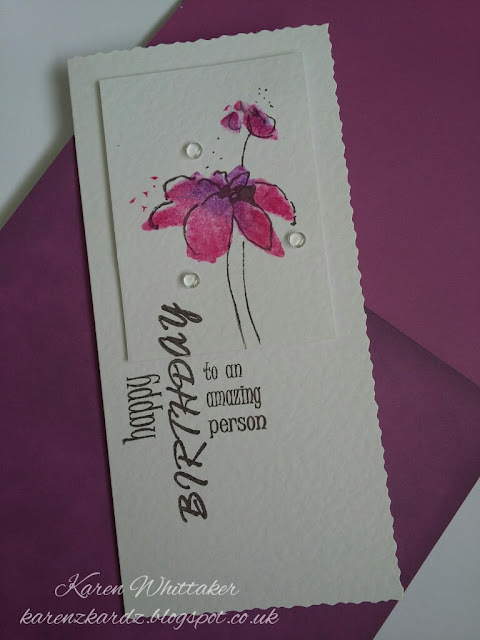 A white pen was used to create a subtle shadow around the flower before attaching this to top of card blank , so it sat above it. I die cut two green and two white ovals then stamped part of the flower head onto each white oval. I also stamped a bee on one before colouring the images in with Kuretake clean colour pens. The flower pot was then stamped onto the front of the card blank. 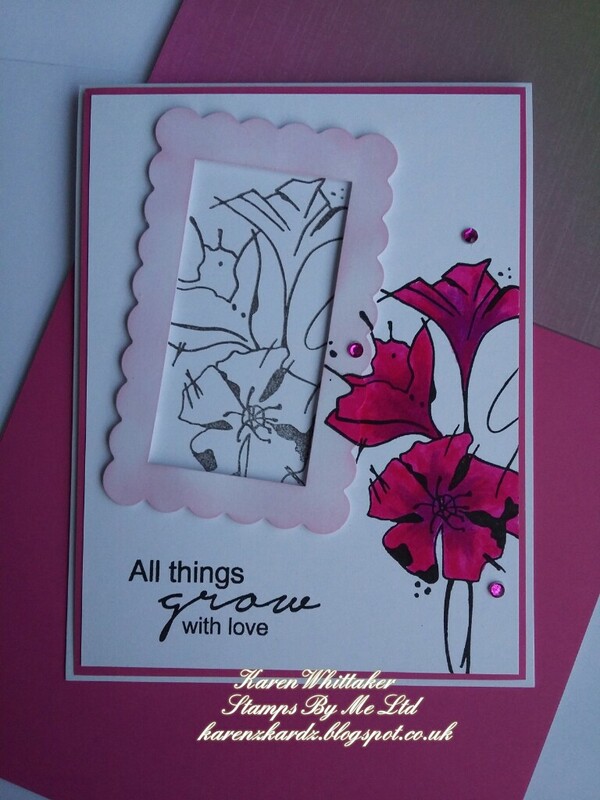 This was masked off before stamping flower head. This was also masked off to stamp the leaves on. All masks were then removed and the images coloured in with Kuretake clean colour pens. 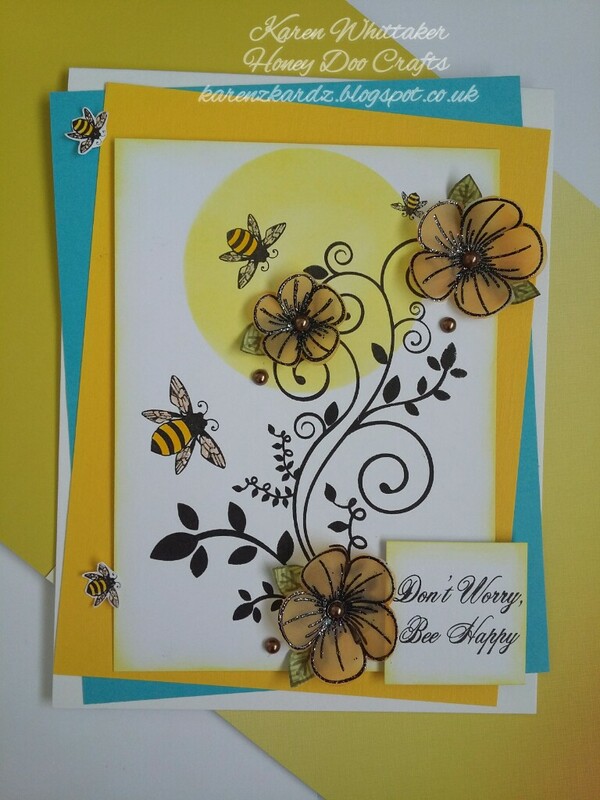 A couple of bees were also stamped and coloured in before stamping the xoxo stamp to complete. I hope you have enjoyed looking through these last samples .